Refer to Wiring Diagrams Cell 42 , Anti-Lock Brake for schematic and connector information. The anti-lock brake control module receives wheel speed readings from each anti-lock brake sensor and processes this information to determine if an ABS event is necessary. The anti-lock brake sensor electrically senses each tooth of the anti-lock brake sensor indicators as it passes through the anti-lock brake sensor's magnetic field. The anti-lock brake control module continuously monitors and compares the rotational speed of each wheel, and when it detects an impending wheel lock, modulates hydraulic brake pressure to the appropriate brake caliper. This is accomplished by the anti-lock brake control module triggering the hydraulic control unit (HCU) to open and close the appropriate solenoid valves. Once the affected wheel returns to normal speed, the anti-lock brake control module returns the solenoid valves to their normal position, and normal (base) braking resumes. The anti-lock brake control module is self-monitoring. When the ignition switch is turned to the RUN position, the anti-lock brake control module will do a preliminary electrical check, and at approximately 12 km/h (8 mph) the pump motor is turned on for approximately one half-second. Any malfunction of the ABS will cause the ABS to shut off and the yellow ABS warning indicator to illuminate, however, normal power assisted braking remains. The ABS control module has the ability to store multiple DTCs in memory. 1. Verify the customer concern by operating the system. 2. Visually inspect for obvious signs of mechanical and electrical damage. 1. Check that the program card is correctly installed. 2. Check the connections to the vehicle. 3. Check the ignition switch position. 4. If the scan tool still does not communicate with the vehicle, refer to the scan tool Manual. 1. CKT914, CKT915 or CKT70 = ALL ECUS NO RESP/NOT EQUIP. 2. NO RESP/NOT EQUIP for the anti-lock brake control module, Go To Pinpoint Test A . 3. SYSTEM PASSED, retrieve and record the continuous diagnostic trouble codes (DTCs), erase the continuous DTCs and carry out self-test diagnostics for the anti-lock brake control module. 6. If the DTCs retrieved are related to the concern, go to the Anti-Lock Brake Control Module Diagnostic Trouble Code (DTC) Reference Chart to continue diagnostics. 7. If no DTCs related to the concern are retrieved, GO to Symptom Chart to continue diagnostics. NOTE: If a wheel speed signal fault or a pump motor fault is detected, the yellow ABS warning indicator cannot be reset with the key OFF and key ON method. The vehicle must be driven over 12 km/h (8 mph) for the anti-lock brake control module to carry out a re-check of the system before the yellow ABS warning indicator is turned OFF. B1318 Battery Voltage Low ABS Go To Pinpoint Test C .
B1342 ECU Is Defective ABS INSTALL a new anti-lock brake control module; REFER to Module . REPEAT the self-test. B1484 Brake Pedal Input Open Circuit ABS Go To Pinpoint Test D . REPAIR the DTCs retrieved. B1596 Repair Continuous Codes ABS Go To Pinpoint Test E .
C1095 ABS Hydraulic Pump Motor Circuit Failure ABS Go To Pinpoint Test F .
C1145 RF Anti-Lock Brake Sensor Input Circuit Failure ABS Go To Pinpoint Test F .
C1155 LF Anti-Lock Brake Sensor Input Circuit Failure ABS Go To Pinpoint Test F .
C1165 RR Anti-Lock Brake Sensor Input Circuit Failure ABS Go To Pinpoint Test F .
C1175 LR Anti-Lock Brake Sensor Input Circuit Failure ABS Go To Pinpoint Test F .
C1222 Anti-Lock Brake Sensor Mismatch ABS Go To Pinpoint Test G .
C1233 LF Anti-Lock Brake Sensor Input Signal Missing ABS Go To Pinpoint Test H .
C1234 RF Anti-Lock Brake Sensor Input Signal Missing ABS Go To Pinpoint Test H .
C1235 RR Anti-Lock Brake Sensor Input Signal Missing ABS Go To Pinpoint Test H .
C1236 LR Anti-Lock Brake Sensor Input Signal Missing ABS Go To Pinpoint Test H .
C1266 ABS Valve Power Relay Circuit Failure ABS Go To Pinpoint Test I . NOTE: Refer to the Wiring Diagrams for connector numbers stated in the Pinpoint tests. Go To Pinpoint Test J . Air in the brake system. Go To Pinpoint Test K .
Go To Pinpoint Test L .
Disconnect: Anti-Lock Brake Control Module C135. Measure the voltage between anti-lock brake control module C135 Pin 8, Circuit 601 (LB/PK), harness side and ground. INSTALL a new anti-lock brake control module; REFER to Module . REPAIR the circuit in question. Measure the resistance between anti-lock brake control module C135 Pin 12, Circuit 1205 (BK), harness side and ground; and between anti-lock brake control module C135 Pin 15, Circuit 397 (BK/WH), harness side and ground. INSTALL a new anti-lock brake control module; REFER to Module . REPEAT the self-test. Check the communications to the anti-lock brake control module. Does the scan tool communicate with the anti-lock brake control module? Measure the battery voltage between the positive and negative battery posts with the key ON engine OFF (KOEO), and with the engine running. Is the battery voltage between 10 and 13 volts with KOEO, and between 11 and 17 volts with the engine running? Depress the brake pedal while checking the stoplamps. Do the stop lamps illuminate? REPAIR Circuit 511 (LG) and Circuit 810 (RD/LG) as necessary. CLEAR the DTCs. REPEAT the self-test. Measure the voltage between anti-lock brake control module C135 Pin 6, Circuit 511 (LG), harness side and ground, while depressing and releasing the brake pedal. Is the voltage greater than 10 volts with the brake pedal depressed and zero volts with the brake pedal released? Check the pump motor for continuous operation. Is the pump motor running continuously? Measure the voltage between anti-lock brake control module C135 Pin 13, Circuit 534 (YE/LG), harness side, and ground. Measure the resistance between anti-lock brake control module C135 Pin 12, Circuit 1205 (BK), harness side and ground. INSTALL a new HCU; REFER to Hydraulic Control Unit . CLEAR the DTCs. REPEAT the self-test. Connect a 30A fused heavy jumper wire between the positive battery post and pump motor connector Pin 1 (component side); and momentarily connect a heavy jumper between negative battery post and pump motor connector Pin 2 (component side). Does the pump motor operate? CLEAR the DTCs. REPEAT the selftest. Is the resistance greater than 10,000 ohms? If RF, REPAIR Circuit 514 (YE/RD) and Circuit 516 (YE/BK), as necessary. CLEAR the DTCs. REPEAT the self-test. If LF, REPAIR Circuit 521 (TN/OG) and Circuit 522 (TN/BK), as necessary. CLEAR the DTCs. REPEAT the self-test. If RR, REPAIR Circuit 494 (TN/LG) and Circuit 492 (BN), as necessary. 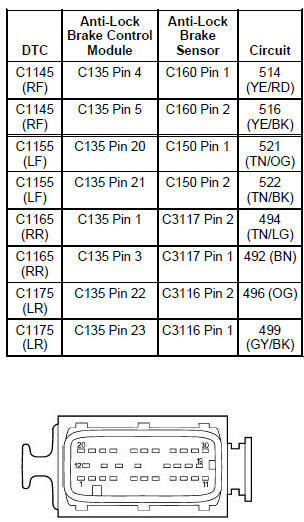 If LR, REPAIR Circuit 496 (OG) and Circuit 499 (GY/BK), as necessary. CLEAR the DTCs. INSTALL a new anti-lock brake sensor; REFER to Sensor-Front or Sensor-Rear . CLEAR the DTCs. Disconnect: Suspect Anti-Lock Brake Sensor. Measure the resistance between suspect anti-lock brake sensor Pin 1 (component side) and ground. Measure the resistance between suspect anti-lock brake sensor Pin 1 (component side) and suspect anti-lock brake sensor Pin 2 (component side). Is the resistance between 1280 and 1920 (front) or 1830 and 2760 (rear) ohms? REPAIR as necessary. CLEAR the DTCs. REPEAT the self-test. Check for correct wheel and tire size, front-to-rear and side-toside. Check for excessive bearing end play. Check the anti-lock brake sensor indicator for a deformation or missing teeth. If another DTC is retrieved, GO to the Anti-Lock Brake Control Module Diagnostic Trouble Code (DTC) index. If no DTCs are retrieved, the system is OK. Enter the following diagnostic mode on the diagnostic tool: CLEAR the DTCs. Test drive the vehicle over 24 kph (15 mph). Enter the following diagnostic mode on the diagnostic tool: Retrieve DTCs. Check the suspect anti-lock brake sensor mounting. Check the suspect anti-lock brake sensor for excessive dirt build up, obstructions, and damage. Is the suspect anti-lock brake sensor and mounting OK? INSTALL a new anti-lock brake sensor indicator; REFER to Sensor-Front or Sensor-Rear . CLEAR the DTCs. Check the suspect anti-lock brake sensor indicator for corrosion, nicks, bridged teeth, damaged teeth, correct mounting, and alignment with the anti-lock brake sensor. Check the air gap and bearing end play. Is the suspect anti-lock brake sensor indicator OK? Enter the following diagnostic mode on the diagnostic tool: CLEAR the DTCs..
Have an assistant monitor the anti-lock brake control module PIDs LF_WSPD, RF_WSPD, LR_WSPD, and RR_WSPD while driving at various speeds. NOTE: The vehicle must be driven 16 km/h (10 miles) during this test step. Test drive the vehicle for 16 kmh (10 miles). Are the anti-lock brake control module PIDs approximately the same at all times? REPAIR the circuit. CLEAR the DTCs. REPEAT the selftest. 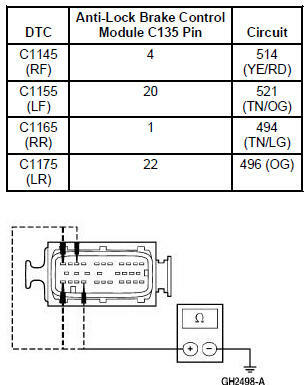 Measure the voltage between anti-lock brake control module C135 Pin 13, Circuit 534 (YE/LG), harness side and ground. REPAIR the open in Circuit 532 (OG/YE). CLEAR the DTCs. REPEAT the self-test. Measure the voltage between anti-lock brake control module C135 Pin 14, Circuit 532 (OG/YE), harness side and ground. Is the voltage less than 5 volts? INSTALL a new anti-lock brake control module. REFER to Module in this section. CLEAR the DTCs. INSTALL a new anti-lock brake control module; REFER to Module . TEST the system for normal operation. Depress and release the shorting bar connector internal to the anti-lock brake control module C135, harness side, while checking the yellow ABS warning indicator in the instrument cluster. Does the yellow ABS indicator illuminate with the shorting bar released and turn OFF with the shorting bar depressed? REPAIR as necessary. TEST the system for normal operation. Check the brake pedal and power booster/brake master cylinder for correct attachment. INSTALL a new HCU; REFER to Hydraulic Control Unit . TEST the system for normal operation. The brake system is OK. TEST the system for normal operation. Check for spongy brake pedal. Is the brake pedal spongy? Check for vehicle tracking poorly. Does the vehicle track poorly? Lift the vehicle and rotate all the wheels to make sure they rotate freely (the vehicle must be in neutral). NOTE: Trigger must be depressed twice. Each press will run the pump motor for two seconds. Trigger the anti-lock brake control module active command PMP MOTOR ON for four seconds. Apply moderate brake pedal effort. Have an assistant attempt to rotate the LF wheel while the pump motor is running. Does the LF wheel rotate? Trigger the anti-lock brake control module active command LF INLET and LF OUTLET. NOTE: The scan tool will energize the valves for only two seconds per trigger press. Have an assistant rotate the LF wheel immediately after depressing trigger. Have an assistant attempt to rotate the RF wheel while the pump motor is running. Does the RF wheel rotate? Trigger the anti-lock brake control module active command RF INLET and RF OUTLET. Have an assistant rotate the RF wheel immediately after depressing trigger. NOTE: Trigger must be depressed twice.Each press will run the pump motor for two seconds. Have an assistant attempt to rotate the LR and RR wheels while the pump motor is running. Does the LR or RR wheel rotate? The ABS system is operating correctly. Trigger the anti-lock brake control module active command R INLET and R OUTLET. Have an assistant rotate the LR and RR wheels immediately after depressing trigger. GO to the Anti-Lock Brake Control Module Diagnostic Trouble Code (DTC) Index. Carry out the anti-lock brake control module self-test.